Flemington, the best-known and oldest racecourse in Australia, is also the Melbourne home of some of the country’s greatest trainers. Some 550 horses are prepared at the world-famous racecourse to run in major races throughout Australia. 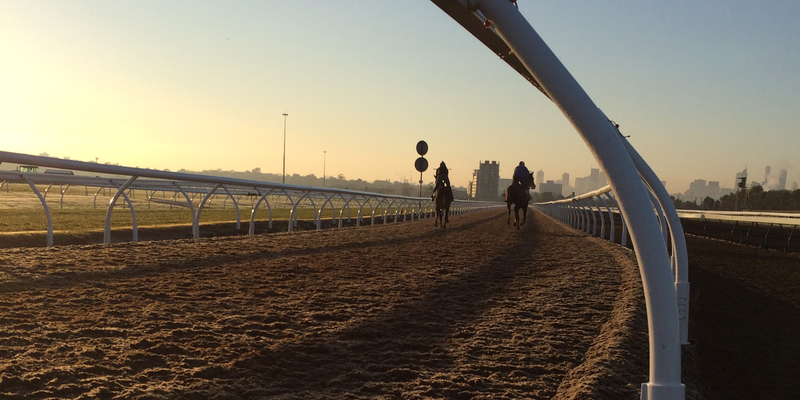 Today, Flemington boasts some of the finest training facilities in Australia including a pro-ride surface, two sand tracks and two grass surfaces. Complete with a swimming facility, it has all the amenities a trainer requires to bring out the best in their runners. Flemington has always been one of Melbourne's leading racehorse training centres, with special training tracks and facilities. For the first hundred years or more, trainers established their stables in the surrounding neighbourhood and walked their horses to the course each day. In the 1960s, the first on-course stables, Chicquita Lodge was built by well-known trainer, Tony Lopes and occupied under a long term lease arrangement with the VRC. The stables were later sold back to the VRC paving the way for future occupant and Melbourne Cup winning trainer, John Meagher. Between 1997 and 2003, the VRC constructed an entire village of training stables on the south-eastern section of the racecourse, and these can now accommodate 800 horses. 1960s: Chicquita Lodge built by leading trainer, Tony Lopes. He was the trainer of the mighty Chicquita.